William Tyler is a talented musician based in Nashville, Tennessee. Known for his work in the bands Lambchop and Silver Jews, Tyler is also an accomplished solo artist and has released four critically-acclaimed albums. His latest is a gorgeous, instrumental record called Modern Country, which is steeped in familiar folk and rock structures but is also eerily expansive and hypnotic. Modern Country is out now via Merge Records and Tyler is playing a number of shows over the next few months, most of which find him opening for the Chicago band Wilco. Here, Tyler and I discuss how things are going in Nashville, the Country Music Association Festival and Bonnaroo, living in Nashville most of your life, Nash Vegas and what happens when your city grows, changes and WXNA, the world’s most talented music city, Harmony Korine is taking his talents to south beach, auditioning for Harmony and Budweiser, Dave Cloud and the Springwater and the Gospel of Power and losing local luminaries, getting older and the song “I’m Gonna Live Forever (If it Kills Me),” the notion behind Modern Country and its relation to America’s current political climate, media mediation and misinformation about different parts of the country you live in, Hillary Clinton and Donald Trump and Bernie Sanders, the illegal and fraudulent conduct of the Democratic National Party, the 2000 Presidential election, Hill feeling the Bern, what Trump is stirring up and people comparing him to Hitler, his platform as it relates to the Republican party’s platform, hatred and racism, projecting a landslide loss, the stigma of intellectualism and the rise of reality TV, hope and faith in the American people, Trump’s imperviousness to criticism, the RNC as imagined by Hunter S. Thompson and Fellini, conveying political thoughts and perspectives via instrumental music, musical intent, receiving external inspiration, the Blind Pig in Ann Arbor and Silver Jews and the Mountain Goats, working with David Berman, lyrics, Wooden Wand, John Darnielle, relating as much to mood as words in lyrics, modernism and archaism, emoji’s and hieroglyphs, Godspeed You! Black Emperor, less talk more rock, adapting to different situations, playing in bands and also not, jamming, the Grateful Dead, Glenn Kotche and Darin Gray, Glenn Jones and Jim O’Rourke and Sir Richard Bishop and John Fahey, O’Rourke deserves more credit, O’Rourke interviews and music recommendations, Glenn and Darin and Insignificance, coming to Canada, touring woes, quiet storm psychedelia, those Silver Jews rumours, pleading with David Berman to write again, the song “I’m Gonna Live Forever (If it Kills Me),” and that was it. Phosphorescent is the moniker of Matthew Houck, a prolific and well-loved singer and songwriter who calls Nashville, Tennessee home. Initially based in Athens, Georgia, Houck began releasing music as Fillup Shack before working under Phosphorescent and releasing seven acclaimed albums with different collaborators. 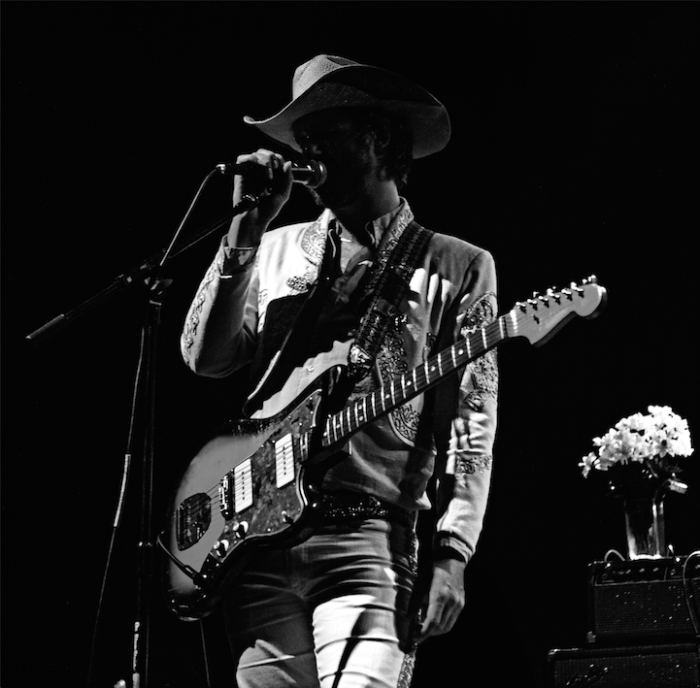 In December 2013, after eight months of touring behind their album Muchacho, Phosphorescent played a four-night homecoming stand at the Music Hall in Brooklyn where Houck lived at the time, with sets that touched upon all of their records up to that point. This past February, Dead Oceans released an explosive document of those shows with the triple LP, Live at the Music Hall, and here, Houck and I discuss moving to Nashville recently, spending time in Australia, David Berman and Harmony Korine sightings, that one time I was in Nashville with Royal City in the year 2000, listening to tapes of live shows, setting up this Brooklyn residency to maybe capture a live record, expending creative energy on a project like this, experiencing a shift in the songs night after night, Hard Rain by Bob Dylan, concerts saved the music industry so live albums must be saving the record industry and the concert industry, the cool album packaging and cowboy cover, dressing the part, getting into music as a kid and knowing one’s path, not always working well with others, being married to an organ player, his relationship with his fans, when Willie Nelson phones your phone, spending time on his bus, having a baby and not knowing what’s next, being a dad, the song “Dead Heart,” and then the show was over.